The Breadbox Letters: Beware of the Blog! Oh, how can that be?! It can be, I guess, because on September 20, 2011, I sat down and started clacking away at a keyboard, and a teensy little spot in the blogworld was carved into place. No one who happened upon that first ramble had a clue of the secret I'm about to tell you now, here on this very screen. Which is that I wrote while shaking in my blogboots. I didn't even do e-mail at the time. I knew nothing about the big wild world of the Internet. I'd felt "nudged" for months to blog, but I barely knew what a blog was. I had never even read one, so how could I have gotten such an idea? Considering the fact that anything involving the Internet was a mystery to me (and I really wanted to keep it that way), I had begun to think this wild notion THAT WOULD NOT LEAVE ME ALONE might, in fact, be an inspiration from God. I could at least give it a try. Except that I didn't. I had gone through the spring and summer of that year trying to convince myself that I must be mistaken, it was just a silly idea. And all the while the thought kept following me around like a puppy. It lodged in my mind like a melody, like one of those tunes you just can't get out of your head - and in fact an old song popped in to keep "reminding me" that I was being chased by a strange notion. The song's lyrics, which I found amusingly appropriate for what I was feeling, sneaked into my brain and (when others were not within earshot) out of my mouth. Because my husband and I once had a "retro" jukebox loaded with old 45s and this record had been one of them, I knew the words to this theme from a campy 1950s movie. So for months, as I drove or cooked or sorted laundry, I found myself constantly singing this - but with one changed word. All you have to do is change the last letter of the title and you'll know just what I was fearing five years ago. It's a fun tune, not spooky, from surely one of the campiest films ever made. Shall we check out what I was humming as I wrote that first blog post five years ago? It's a splotch! A blotch! 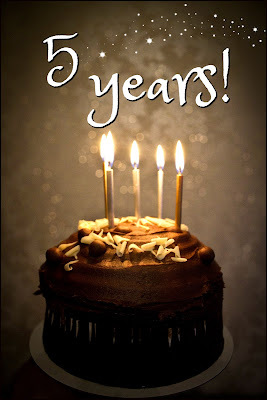 Congratulations on your 5 years of blogging. I have been blessed more than once by something that spoke right to my heart when I needed it. Happy Blog Anniversary, Nancy!! Lol - you crack me up! The Blob? Really? Yep, the Blob. Really. The song stuck in my head for months. I'd find myself giggling at the absolute absurdity of it. The fact that we'd had it on a jukebox record made my remembering it a little less ridiculous, but STILL. I am so glad you listened to that persistent voice and started blogging! I have greatly enjoyed and benefited from your words of wisdom, both your own and the quotes from saints that you've posted. Also that wonderful video of "Come My Way", that I keep going back to hear again and again. Hee hee, I love how God used that silly song to nudge you! He can use all things for His glory! I promise that one is NOT a silly song :))! But I'm glad God did use a silly one to nudge me along. Thanks so much, Susan! Happy birthday to your blog, Nancy! Congratulations on your five years of blogging. I know it's not always easy to fnd something to post week after week, day after day. Inspiration sometimes deserts us. Yes, we have our up days but lots of down ones too. Thank you for always finding something uplifting or funny to share with us, posts that help or entertain. I know there have been many times when I've almost given up blogging. Each time I haven't been able to find something to write about, you have shown such great empathy and encouraged me to keep going by making me feel that even my smallest efforts are worth writing. I love sharing this blogging adventure with you. Like you, I hardly knew what a blog was when I created my first one. It's amazing what we have both learnt over the last 5 years! (I think I started blogging in 2011 as well.) Onto the next five years... May God bless your work here online! Sue, thank YOU for keeping on - I can't imagine not keeping up with you and your delightful family; you have truly become part of my life. Isn't that so COOL?! Finding friends like you was not anything I thought about at all 5 years ago - in fact, my son who first set me up to blog said I "would not want to allow comments." I just took his word for it, but it wasn't long before I realized that while HE might feel that way, I most definitely did not! You know how much I've loved your stories over the years - Bob Blogosphere and Elvis' wife and body butter! And now the Angels of Abbey Creek, and Imogen's music videos. And I think your approach has given me "permission" to let my own blog(s) change from time to time. May God bless your work too, and may we keep learning more and more how to serve Him! OH!!! 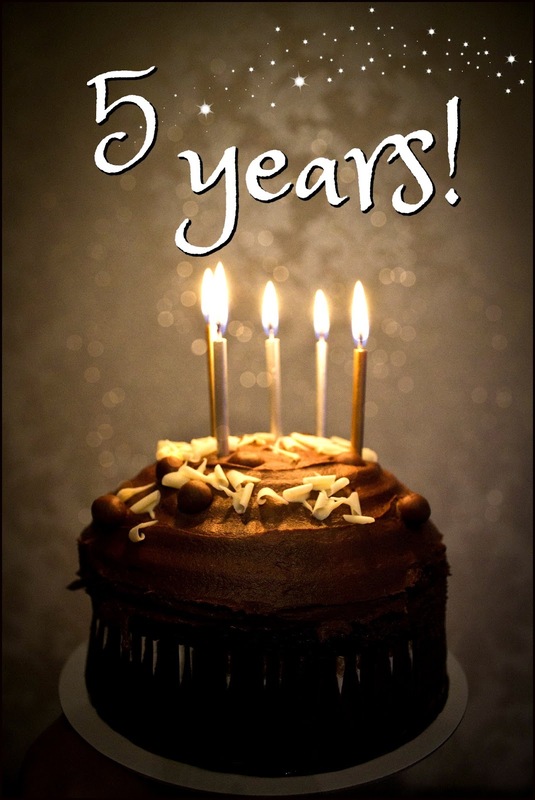 Happy blog-anniversary!!! You are such an inspiration, Nancy!! You have made my day, Patty! I love thinking of Miss C enjoying the Blob along with her yogurt :). My kids absolutely loved the song when they were little, played on our home jukebox, and I'll admit I loved it too. I think it has such a happy sound.. definitely NOT "scary movie" material!